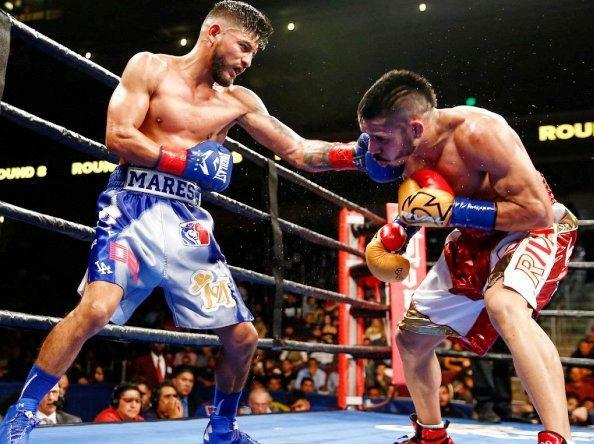 In an impressive performance, 31-year-old former three division world champion Abner Mares (29-2-1, 15 KOs) defeated the bigger and stronger WBA World featherweight champion Jesus Cuellar (28-2, 21 KOs) by a 12 round split decision on Saturday night to rip his title away from him in a fight on Showtime Boxing from the USC’s Galen Center in Los Angeles. Mares surprisingly dropped the 30-year-old Cuellar in the 11th round to seal his victory. The final judges’ scored were 116-111, 117-110 for Mares, and 115-112 for Cuellar. The difference in the fight wasn’t the punching power of either fighter. It was the hand speed and defensive skills of Mares. He was the much faster guy, and the more elusive of the two. The southpaw Cuellar was coming straight ahead all night long looking to take Mares’ head off with each shot he threw.